For the last three weeks I was on fieldwork for our research project in Calabria. For a quick overview of the project, see here. This time we were focused on a particular landscape parcel, with one other site a bit further away, which was nice as the team ate lunch together most days, and it was very easy to see what the ‘other half’ were getting up to- fieldwalking and test pitting. We were concentrating on gradiometer surveys for the first half of the work, which was nice for me as the data is a bit easier to deal with than EM data- I wasn’t putting in hours after getting back from the field trying to get the data into a state where we could assess it. It was nice not to be fighting with unfamiliar kit and software, though I did have a minor dim moment! In the second half I did a lot of MS surveys, and also started to learn the practical aspects of caesium vapour magnetometry- like exactly how hard it is to keep a 1m vertical gradiometer properly aligned walking up steep slopes. I like learning new things, so it was very exciting for me to work with a totally new bit of kit, hands on. Unlike the April campaign, we had anomalies that definitely resemble archaeology on all of the sites we looked at. Though the project (or my bit of it) is all about doing the tricky, ephemeral stuff, I’ll admit it was very nice to see clearly structural anomalies appearing that were consistent with what we’d seen on other sites. I’m firmly of the opinion that archaeological geophysics needs to move away from plan-view, ‘pattern recognition’ type surveys, and start dealing with the fuzzier stuff, and thinking outside of grids and plans and maps, but it was reassuring to see something instantly recognisable in the data. It’s also nice for the landowners we work with- a plot with a series of small structures and possible enclosures makes much more sense to them than me talking about variance analysis or some vague, fuzzy blobs that might be something if we can tease out the details. While we were there (you might have heard me whine about it on twitter) there was something of a heatwave- it topped 40 degrees on a few days, and the Italian media were reporting on it and even the locals were fed up with it after a few days. I coped a bit better than I thought, but I had a couple of ropey days, and it affected when we were able to get into the field to work. It was good to go down early, ahead of the bigger team, with Wieke as I got to practice driving with no-one watching (or being endangered!). I was doing pretty well by the end of it, but wasn’t quite brave enough to tackle manoeuvring the Subaru around in the pokey underground parking garage. I did drive (a little bit) off road, and on all kinds of roads from winding mountainsides to the fast straight main roads down on the plain. It was good to get the fear of it out of my system! Wieke’s car is awesome to drive, and very very forgiving of my mistakes, which helps. 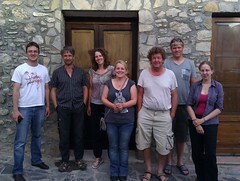 We went to the Santuario in the mountains near Cerchiara, and visited the local sulphur spring baths and mud spa twice! We also had an excursion to a cave in the cliffs above where we were working- an area called the ‘serra del gufo’ or ‘cliff of the owls’! We went with a local climber and speleologist who has explored caves all over the Pollino national park. He knows Martijn and Wieke well, and is the source of a lot of our information about Protohistoric cave and mountain sites. Nino and his friend Angelo were wonderful guides and instructors and I felt very very safe, despite getting a bit freaked out at one point. Calabria is an amazing place. Time and again I was amazed by the friendliness and generosity of the locals- people always stop to say ‘Hi! How was your day? Did you find anything? Do you like the village? What is Groningen like?’ They are also very patient with my attempts at Italian, forgive my mistakes and laugh at my feeble tries at making jokes. I can’t wait until we go back, and in the meantime I have a lot of interesting data to look at, some new processing techniques to try out and a lot of reports and papers to write! The team! (minus Martijn, who had already left to go on a family holiday)… left to right, Steffen Seitz, Mainz University, Ulli, Eastern Atlas and FU Berlin, Wieke, GIA, Me, GIA, Prof. Peter Attema, GIA, and Jelmer and Charlotte, two lovely GIA 3rd years who worked like troopers in pretty insane heat. Such a great time, and an awesome team!